Faery Hair: Faery Hair Sparkles by bike! Faery Hair Sparkles by bike! Thursday, August 20th, 1:30-3pm, Starbucks, 20th and West Burnside, drop in! Thursday, August 20th, 4-5pm, World Cup Cafe, 1740 NW Glisan, drop in! *Saturday, August 29th, 11am-6pm, Grand Opening of the Fernie Brae, 41st and SE Hawthorne, with book signing by the Frouds, and many other Faerie artists and activities. 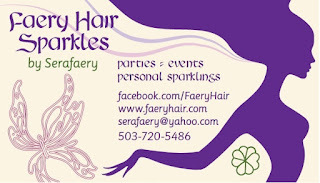 Pixie and Serafaery will both be sparkling. Please join us! *Sunday, August 30th, 12pm-4pm, the Fernie Brae, 41st and SE Hawthorne, with a children's fairy camp, portraits, and more. Please join us!